A Very funny movie with smart humor and some extremely cute characters. Despicable Me is a great movie. Most cg animated movies these days are pretty good based only on story. The humor is there, but creativity behind the story is what makes them so special. Just look at wall-e or ratatouille for example. There was certainly humor mixed into the movies, but the visionary story lines were what brought the movies home. Those movies were enjoyable, but in the end, they weren’t really films that could be watched again and again. The same can be said about up. All three were Pixar movies, and all three were certainly smart and creative. Wall-E was the most out of the box-animated movie since the little mermaid. I mean, half the movie was just robots making noises. But what worked on a first viewing didn’t really hold up for much more than that. Wall-E ended up feeling long and tiring upon multiple viewings. Ratatouille started to feel a little annoying (the rat was fun, but the chef and the bad guys were idiots). And up started out with some real emotion, but then ended by turning into the same old thing we’d seen before. And while Pixar was making these kinds of movies, DreamWorks was doing something very different. DreamWorks is the studio that rivals Pixar with animated movies. When Pixar made wall-e in 2008, DreamWorks made Kung Fu Panda. It wasn’t half as smart as wall-e, but it was certainly a lot more fun. This was a movie that you didn’t have to think about. The humor just rolled off the screen. It was the every man’s animated movie. The guilty pleasure of animated movies. Whereas Wall-E was more for the thinking man and intellectuals (look at how artistic it is), kung fu panda was more for the goofy kid in all of us. Well, Now there’s another great-animated movie out from 20th century fox. It’s Despicable Me, and just like kung fu panda, it’s the kind of movie that you don’t have to think too much about and can just appreciate for the humor. 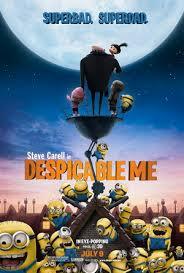 Despicable me am not great on story, but makes up for it with a huge amount of very funny characters. The movie is about a bad guy who thinks he is the ultimate super villain of the world. He’s not like a massive celebrity or anything, but just a real evil guy who likes to think he’s the worst of the worst. His name is Gru, played by Steve Carell and he has a thick foreign accent. At the beginning of the movie, we just watch all of the mean things he does. And they are quite funny. He drives his giant metal air ship-car around the city and parallel parks by hitting all the cars around him. He then continues to hit them until they are nowhere in sight. 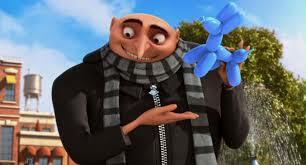 When he sees a boy crying because he dropped his ice cream on the floor, Gru makes him a balloon animal. And just when the kid is happy and has forgotten all about his dropped ice cream, Gru pulls out a pin and busts the balloon, sending it popping right onto the kid’s face. It’s a great introduction to this funny character, and even before we get to it, we get a scene out in Egypt where a kid jumps onto a pyramid and bounces off it, revealing to the world that the real pyramid has been stolen from Egypt. Gru is not the one who stole it. And hearing about this new super villain on the news just makes him want to do something even bigger. His plan is to steal the moon. Gru goes to a secret bank for super villains of the world and sits down with the bank manager. He asks for a loan like he apparently has done many times before in the past. Only this time things are different. Compared to this new super villain who just stole the pyramid, Gru looks like a tired old man. And his plan to steal the moon would involve a special kind of gun that can shrink things. The only problem is, he doesn’t have the gun. The bank manager introduces him to the guy who stole the pyramid, a nerdy looking fellow who wears glasses and jump suits and is waiting outside. This guy is the newer, younger super villain and he is suddenly Gru’s enemy. Gru now attempts to steal the shrinking gun from some scientists on his own. Things seem to be going pretty well until that new villain shows up and steals the gun away from Gru. We get a cool aerial dogfight showdown in the sky, but in the end, it’s the new super villain who has all the skills. And so Gru must now come up with a new plan to get into this guy’s lair and steal the shrinking gun right back. Gru’s plan involves adopting three little girls who live at an orphanage and go door-to-door selling cookies. When Gru sees thee girls sell cookies to the super villain, he suddenly has an idea. “Light bulb,” he says. He will adopt the girls and use them to help him get inside. And that’s exactly what he does. Only now he actually needs to spend some time with the girls and act like a real parent. At least for appearance sake. And watching that is a lot of fun. Gru not only knows nothing about being a parent, but he doesn’t even like kids. At all. And he has a lot of fun interactions with them. My favorite scene in the movie has Gru read a bedtime story to the girls, in his thick accent, about kittens going to bed. The story is really sweet and cute and Gru thinks it is ridiculous. He keeps commenting on how awful it is as he’s reading it, and the smallest girl keeps asking him to do things with the kitten puppets that are in the book. First he has to make them drink milk. Then he has to brush their hair. It’s extremely adorable. As if the girls and Gru’s reactions to them weren’t enough, the movie also gives us tiny little yellow minion creatures that work for Gru. These guys don’t talk at all, but instead make funny noises and bop each other around, and are also like little kids. They are also extremely cute. At one point Gru tells the girls that it’s their bedtime and the minions get sad. Then Gru tells the minions he doesn’t mean them. These guys, just like the girls, are very cute and very funny. Between the three little girls and the tiny yellow minions, this movie has cute covered in all different ways. The girls do the funny talking and the minions are more have the silent or noise making slapstick humor of the movie. And as if all of that wasn’t enough, Steve Carell’s character and the situations he is thrown into are also very funny. His accent and comic timing are right on the money. The story might be fairly generic, about two super villains in competition with each other (in a lot of ways it reminded me of The Incredibles), and an evil guy learning that he really has a strong and sensitive heart, but the humor here goes a long way. It’s enough to make this movie a lot of fun, and certainly full of enjoyable laughs.